As a kid I was never very creative with food, which is odd since my mother experiments with food all the time. Not me, I was the kid that ate a peanut butter and jam sandwich every day for a year, I never put chips in sandwiches, or mixed cereals together. For the most part I wasn't picky about what I ate but I liked what I liked, and felt no reason to mess with that. I remember going to a friend's house one afternoon in elementary school and fixing some PB&J sandwiches for a snack. Bread, peanut butter, strawberry jam, done... but then I watched as my friend pulled out a bottle of Nestle Quick Syrup and poured it all over the sandwich. I couldn't believe it. Isn’t that for milk? Is this allowed? I was no stranger to peanut butter and chocolate but this was unheard of and it tasted awesome. I think every PB&J sandwich I made for the next few months included chocolate syrup. My lack of food creativity meant that I never experimented with flavour combinations, many of which are considered classics. Things like peanut butter and banana, or banana and chocolate did not belong together. I think my first experience with banana and chocolate was when I baked my first batch of brownies a few years ago. I fell in love with the combination. Perhaps part of the reason why I like to change and play with recipes now, is because I was so averse to doing so when I was younger. As I approached my blog's two year anniversary, I began to think about what special thing I wanted to bake for myself to celebrate. Unlike last year, I didn't really have a clear picture of what that would be. There were a few things swimming around my head, but nothing that stuck out. Although I was pretty sure it should be chocolate. In my bookmarks I found numerous references to Hershey's "Perfectly Chocolate" Chocolate Cake that, by all accounts, is a terrific chocolate cake as is. However, by all accounts, there is something very wrong with me :). In fact, this is one of those times where the line between "adapted from" and "inspired by" is completely blurred. I followed the recipe but changed nearly everything about it. 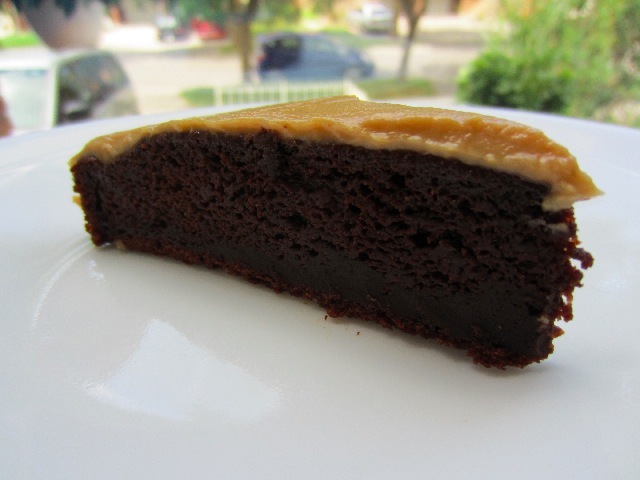 I paid homage to my first baking venture, my long obsession with peanut butter, and my current obsession with Greek yogurt; turning a chocolate cake into a banana chocolate cake topped with my faovourite pb frosting. With that in mind I'm not going to bother listing exactly what I changed just assume that, for the most part, it has been changed. 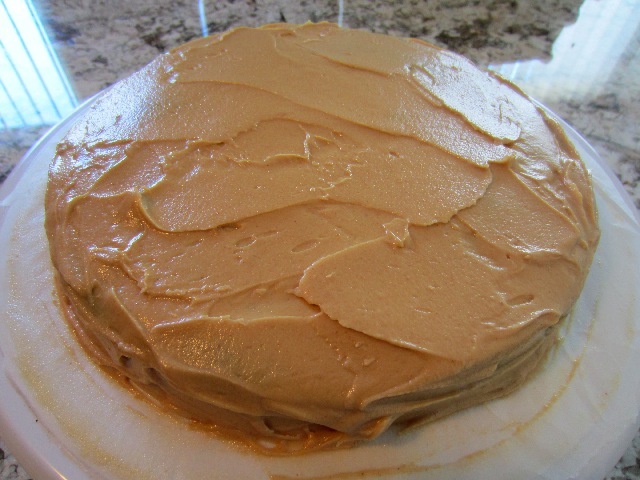 What I ended up with was a thin, dense cake topped by a layer of what continues to be my favourite pb frosting; it is beyond fantastic. It’s the perfect balance between sweet and salty with a focus on peanut butter flavour. 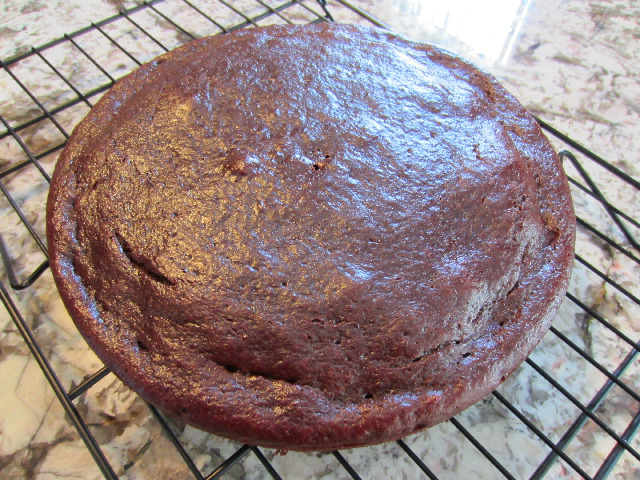 As for the cake, despite how it looks it is not at all rich, and has a slightly chewy almost brownie like texture. As a warning it has a soft crust that isn’t extremely easy to fork through; but beneath that crust lies a tender and moist cake with a huge amount of chocolate-banana flavour. And I probably don't even need to tell you that when the cake is combined with the pb frosting the flavour is taken to a new level (like World 8 type stuff, boss fights and everything :)). One thing to note is that the layer of frosting needs to be kept thin. The peanut butter flavour is strong enough that if you add too much you will lose the taste of banana. I love this cake and I love that it was an experiment that turned out so well. I made this version a half recipe entirely because I was unsure if it would turn out, and now I can't wait to try again with a full recipe. Oh and just so you know, this is going up way later than I had planned. When I said “later this week” last Wednesday I actually meant Friday. But the end of last week was pretty crazy and somehow I managed to fill a lot of time over the weekend, though I have no idea with what (lets pretend that my memory if fuzzy because I had too good a time :)). P.S. If I named my posts, I would have probably called this one "Chocolate, and Banana, and Peanut Butter!.. OH MY!"... yes/no? :). **Note: Recipe makes enough frosting for a two layered cake, but reducing makes it difficult to mix. Preheat oven to 350F and grease a round 9" cake pan and line the bottom with parchment paper, grease paper. In the bowl of a mixer whisk together flour, cocoa powder, baking powder, baking soda, salt and sugar. Add banana, egg, yogurt and beat together until completely combined. Pour batter into prepared pan and bake for 30 to 35 minutes or until toothpick comes out clean (this took me 35 minutes). Allow to cool in pan on rack for 10 minutes before removing and cooling completely. In a small saucepan over medium heat add peanut butter and milk and whisk until melted. Add powdered sugar and whisk until completely combined. Remove from heat and allow to cool. In the small bowl of a mixer add cream and whip until stiff peaks are formed. Slowly add cooled peanut butter mixture to whipped cream and mix together. Allow to thicken in fridge before frosting cake. When cake is cooled, apply a thin layer of frosting over the cake. It's so funny that you weren't 'experimental' as a child because you're so experimental on this blog--I would have totally pegged you as the kid that combined cornflakes and Lucky Charms or tried pouring orange AND grape juice on top of your Cinnamon Toast Crunch! I've seen the highly-rated Hershey's recipe before and I love the idea of lowering the fat with yogurt and banana and adding extra 'tang' and flavor to it--even when it wasn't considered edgy to merge salty with sweet, it's true that is why peanut butter is so versatile in so many cooking applications, because it has both properties. Your childhood friend's sandwich, btw, is something I've never heard of anyone making...but now I'm thinking that stuffed peanut butter and banana French toast with chocolate sauce would be a pretty awesome brunch combination! These days baking is probably my only creative outlet, which is another reason why I probably play with everything so much. But I am definitely one of those strange people that can eat the exact same thing every day and be fine with it. That french toast idea sounds pretty good, but don't forget the strawberry jam :). And to be fair, good or bad, no one's burgers are like McDonalds :).